Suckafish P. Jones, the self-proclaimed ringmaster of voodoo electronics, returns to evil up your sound system with his second EP ‘Mr Midnight’ for Disboot. Released on 12″, Suckafish summons up four tracks of jagged robot funk from the depths of the swamp. Perverting the tropes and conventions of Uk Garage, Grime and hip hop, ‘Mr Midnight’ combines pulsing low end rhythms with possessive melodies to create a soundtrack for that full moon night that never ends. Sleazy, emotional, violent and ecstatic at the same time, Suckafish’s latest offering maintains his reputation for productions that ignite the dance with raw, infectious energy and humor. ‘Match Set Point’ sets off the proceedings in style, with it’s jerky hip hop beat propelled by apocalyptic toms and metronomic pulses. Threatening to crack apart like thunder at every turn, but holding us in its chaotic hypnosis, the track swirls its way through psychedelic arpeggios and bent, cascading vocals which remind us that, yes, ‘…the bounce is back’! The EP’s second track, ‘Wild and Dirty’, turns up the temperature; with its fractured post-dubstep beat that snaps open growling, detuned basslines and robo-funk melodics. Urgent, epic and overheated, it challenges you to drop any head-nod pretenses and start shaking like you’re possessed. ‘Bubble Farm’ offers perhaps the most jittery dancefloor-oriented offering of the EP. Combining elastic synthesis with hip swinging rhythms and tropical electronics, the track jerks us back and forth in impossible maneuvers within its fractured, low end bounce and melodic intricacy. To end, ‘The Touch’ pours out of the speakers as a solid barefoot beat carrying a wave of rich, dense analogue synths. With it’s ridiculously loose, manic LFOs, ‘The Touch’ throbs and snaps its way out of the speakers with all the swagger of a gold-tooth club classic for the post apocalyptic future. 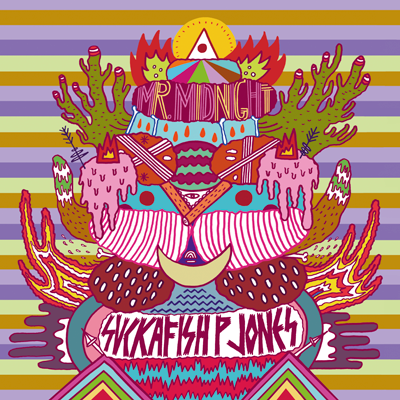 ‘Mr Midnight’, by Suckafish P. Jones, was released on 12″ in Oct 2010 and is available from independent record stores and internet music vendors.